Reprint. Originally published: London: Corgi, 2015. 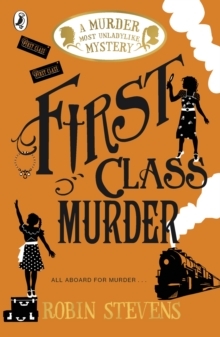 The third instalment in the bestselling Murder Most Unladylike series; just like the iconic Agatha Christie, Hazel and Daisy have boarded the Orient Express! ----- 'A delight . . . Hazel and Daisy are aboard the Orient Express: cue spies, priceless jewels, a murder and seriously upgraded bun breaks' The Bookseller'Addictive . . . A rumbustious reworking of Agatha Christie's Orient Express caper' New Statesman----- Daisy Wells and Hazel Wong are taking a holiday on the world-famous Orient Express - and it's clear that each of their fellow first-class passengers has something to hide. Even more intriguing: there is rumour of a spy in their midst. Then, during dinner, there is a scream from inside one of the cabins. When the door is broken down, a passenger is found murdered, her stunning ruby necklace gone. But the killer has vanished - as if into thin air. Daisy and Hazel are faced with their first ever locked-room mystery - and with competition from several other sleuths, who are just as determined to crack the case.